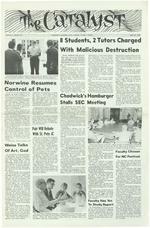 Volume II Numbe r 29 PubliShed by Students of New Colle ge, Sarasota, Florida Ap ril 29, 1966 8 Students. 2 Tutors Charged With Malicious Destruction Seven students and two tut o rs were arrested Monday and charged at the Sarasota sheriff's office with malicious destruction of personal prop:, erty. An eighth student was arrested Tuesday. destruction of a 1953 Ford automobile reportedly owned by Spanos, Bruce Lamartine and Dennis Kezar. In a telephone interview last night Spanos told The Catalyst Lamartine's and Kezar's names are not on the title to the car. listed in the warrants "from several people." He indicated at least one New College student sup p 1 i e d names. He said photographs taken by firstyear student Leonard Lewis had been turned over to the Sheriff's department and will probably be used as evidence. Constable Reed Chadwickreadswarrants sworn out against eight students and two faculty members. Dean of Students Robert. Norwine looks on. Arrested Monday were secondyear students Dan Jaecks, Charles Raeburn, David Pini, Craig Bowman, John Daugherty; first-year students Vicki Pearthree and San di Stewart; and tutors Mike Mather and Sam Black. Second-year student Ray Enslow was arrested Tuesday. According to inform at ion filed in the warrants, the students damaged the automobile April 17 while it was parked on the east campus. Spanos said the car had been in the parking lot for a month "without being moved. 11 Each of the ten posted a $100 bond and was free Tuesday afternoon. According to Spanos he would have moved the car "but people stole stuff off it and made it impossible." "Before I took out the warrants, 11 he said last night, "I looked at every angle--talked to several people. They thought it was a dirty trick. 11 Norvvine Resumes Control of Pets The ten were arrested by Constable Reed Chadwick on warrants issued by Justice of the Peace GeorgeFossler. The warrants were sworn out by Richard Spanos, a student at Sarasota High School. The group is charged with the Raeburn told The Catalyst the group has engaged legal counsel. Ahearing in Justice of the Peace court is scheduled Thursday at 8 pm. Spanos, who did not witness the allegeddestruction ofthe car, told The Catalyst he received the names Referring to the persons listed in the warrants he said, "They didn't know whose it (the car) was. That makes it worse. If they aren't stopped now, when will they be?" Con t r o 1 of pet registration on campus has been returned to the Office of the Dean of Students, it was announced yesterday. In a memo dated and distributed yesterday, Dean Robert Norwine, Dean of Students, withdrew control from the Student Executive Committee because it "has proved either unwilling or unable to accept the responsibility." authorized cats and dogs on campus will wear a current rabies tag, if the animal is over three months old. Thistag must be provided by the owner before noon of Friday, May 13, 1966. After that date, cats and dogs ( o 1 de r than three months) not wearing current rabies tags will be impounded." Chadwick's Hamburger Stalls SEC Meeting Spanos said several times during the telephone interview, "I don't want to hurt these guys. I don't want to get these guys in trouble." When asked if he would drop charges if he were reimbursed for his loss he replied the affair is out of his hands. "Itisuptothejudge," he said. The memo says "Conditions of Occupancy regarding students' pets on Campus have long been pub lis.heo.l and disregarded. "All pets (including birds), the memo continues, "which were not completely through the SEC, Dean of Students, and Capt. Styles' oifice yesterday (April 27) must be removed from Campus by their owners no later than noon 'of Tuesday, May 10." The memo then lists six students who are the "only students authorizedtokeepaspecific pet on campus. No other students will be allowed to keep pets on campus durfng th' remainder of this academic year," according to the memo. It also says, "Henceforth all Weiss Talks Of Art, God Dr. Paul Weiss, Sterling Professor of Philosophy at Yale University, concluded the 1966 New Perspec tives Series last night in College Hall. Dr. Weiss' topic was "A Philosopher Looks at the Arts"; he also returned to several questions raised by Dr Nat han Scott's lecture on "Death of God" (Dr. Scott was the first lecturer in the series. ) Dr. Weiss' lecture was concerned with the problems of speaking of intangibles such as art., ethics, and God. He attacked the common attitude that (1) everything, such astables, chairs, and other partic ulars, we conceive is of this world and (2) ethics, art, and religion are not such subjects and therefore canuot be discussed in ordinary language. He feels that common language can be used in a special way to discuss such matters. He said that art and metaphysics are "running broad jump enterprises"; it is necessary to tum one's back on the world to make a proper rehtionship with God, and to separate a work of art from practical applications. God is both transcendent and imminent. Dr. Weiss characterized a philosopher as a blind man on a dark night looking for a black cat that im1t there; the old theologian always finds the cat; the new theologian knows the cat wasn't there today or yesterday, but tomorrow ... The lecture was followed by a question and answer period. Authorized pet owners are required by the terms of the memo to submit in writing to the Dean of Stu dents Office c e r t a in information about their pet. The memo concludes, "Students k e e pin g pets in violation of the above rules will be subject to discipline by the Dean of Students. The manner or type of discipline was not specified. Pair Will Debate With St. Pete JC First-year students Dan Haggarty and Patricia Sanderson will debate a team from the Gibbs Campus of St. Petersburg Junior College after dinner tonight in College Hall. The pair will take the negative side of the topic, "Resolved that law enforcement agencies in the United States s h o u 1 d b e given greater freedom in the investigation and prosecution of crime." Haggarty was a high school varsity debater, and his team in 1962 won the Wisconsin championship. He was a two-time gold medalist in extemporaneous speaking and was Wisconsin Catholic War Veterans Oratorical Champion. Miss Sanderson was a member of her high school debate team, and she placed first in extemporaneous speaking contest s two years in the Diocese of Miami. Bill Chadwick was absent from Wednesday's meeting of the Stu dentExecutive Committee, reportedly because he was off campus having a hamburger, and as a re the meeting could uot for lack of a quorum. Chadwick confirmed for The Catalyst yesterday the reports about his absence. He said he was traveling to he remembered the meeting. He saidhehadjust forgotten there was a meeting. Wednesday's absence was the latest of many for Chadwick. He was present, however, at the "unofficial" meeting last week which was also canceled for want of a quorum. It was reported to members who were present the Student Disciplinary Committee's scheduled meeting Monday was not held. The reason given was Chadwick's absence. He is chairman of the SDC. See Editorial page 2 Although there was no quorum, the rrembers conducted an informal discussion of several matters. Tim Dunsworth, SEC secretary, took notes of this discussion. According to these notes, Arthur M. Miller, who attended the meeting for Dean Robert Norwine, said Chadwick should be prodded a little to attend to his duties or give them to someone else. With reference to recent trouble involving a car belonging to Sara sota High student Richard Spano s, Miller t old the committee Spanos Dr. Paul Weiss, Sterling Professor of PhilosopliY at Y:Ue University, met andtalkedwith agroup of about fifteen students and faculty at lunch yesterday. Above, Dr. Weiss makes a point, while Dr. Gresham Riley, Allen Whitt, and Sam Treynor listen. Despite the presence of almost a dozen people at Wednesday's scheduled SEC meeting, chairman Kenji Oda (lower right corner) could not call the meeting to order due to the lack of a Quorum of voting members. andhiscarwere on campus against college regulations. He said the SEC should perhaps guard against future problems by tightening guest and visitor guidelines or giving the issue over to Dean Norwine. Miller said animals on campus may easily become a problem, according to Dunsw orth' s notes. He said the SEC should "get going" on pet registration and should keep in mind the pos s ibility of retracting the privilege entirely. Miller also reported Dean Norwine is concerned with the minutes of the SEC, as to whether they are published, posted, or even kept permanently, the notes say. Dunsworth reported the minutes are kept permanently. Dunsworth' s notes record Dean Norwinehashadthe "flu" and may notbebackoncampus for "a while yet." The final entry in the record for Wednesday's "unofficial" meeting is: "We simply must talk about proxies and quoriiiiiS and things like that whett we can get a quorum together. Faculty Has Yet To Study Report Dr. RollinPosey, chairmanofthe facultycommittee that is studying the third-year program, told The Catalyst yesterday that his committee had not yet discussed the contents a! a report sent to him from the Student Curriculum Committee. Faculty Chosen For NC Festival The teaching faculty has been announced for the second annual New College Summer Music Festival, which will be conducted June 19 to July 3. Ten noted musicians will offer instruction in vario us instruments and will coach ensembl e sessi o n s In addition, they will be featured in a series of seven concerts. The festival offers to amateur and professional musicians classes 1n piano, strings, winds, brass, and in ensemble playing. Chamber music will be emphasized throughout the program. Serving on the faculty for the second year will be director and violinist Paul Wolfe, pianist Jacques Abram, oboist Robert Bloom, violinist Walter Trampler, bassist Gaston Dufresne, and Miss Patricia Stenberg, woodwinds. New to the faculty this year will be cellists Gabor Rejto and Leslie Parnas, French hom player John Barrows, and flutist Julius Baker. dasssessionsfor the festival will be held on the New College campus. Mornings will be reserved for lectures, group sessions, and semi nars; afternoons will be a continuation of classes, open rehearsals, and ensemble co:ching; orchestJ;a rehearsals, performances, and group sessions will take up most of the evenings.